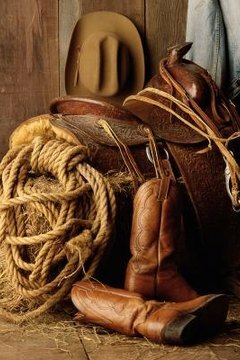 Almost all western saddles feature rear billet straps that can be used to secure a rear cinch if desired. The rear cinch can be a useful piece of equipment during high impact equine activities, where there is a significant likelihood that the saddle may shift or equipment could break. Reach cinch straps are seen most commonly in roping and ranch work, but also may be used during speed events and trail riding. Rear cinches, also known as rear flank straps or rear girths, are designed to provide a backup girth in case your front girth fails. These cinches also work to stabilize the saddle and help keep it anchored sturdily to your horse's back during highly competitive, high impact equine activities. The rear cinch strap, otherwise known as the rear flank strap, rear girth or back cinch, fastens to the rear billets of your saddle. The back billets typically are placed approximately 3/4 of the way down the side of your saddle; you can see them on either side of the saddle beneath the rear of the seat, which otherwise is known as the cantle. The billets are standard leather or nylon straps with holes punched in them. Rear girths are not the same as the girths that are used in the front of your saddle and you should not attempt to use a standard front girth on the rear of your saddle. A rear cinch strap is a specially designed strap of leather with buckle ends on either side that can be fastened to the billets on either side of the saddle. The rear cinch strap should be snug, but not extremely tight. Your rear girth strap also will feature a small strap of leather in the center of it that fastens to the front girth underneath the belly of your horse. This should be buckled to help prevent slipping. Almost all western saddles feature back billets, but some inexpensively manufactured saddles simply have them there for looks rather than function. If you are planning on using a rear cinch, then you must thoroughly examine how your back billets are attached to your saddle. A saddle with functional back billets will have thick metal dee rings to which the back billets attach. These dee rings are attached the tree of the saddle and also may be strapped to the front dee rings for extra security. If your saddle does not have dee rings, then the billets are going to be fastened to the skirt instead. If the hole in the skirt is reinforced with metal around the edges, then the back billets should be functional for using a back girth. If you can ot see or feel any kind of metal or reinforcement other than the leather itself, then you should assume your back billets are not functional. Do not attempt to attach a back girth to them without contacting your saddle's manufacturer and making sure a back girth can be used with the specific saddle. Attaching a back girth to a decorative billet can cause the saddle skirt to rip or break when pressure is applied, which can lead to serious injury.